The beloved children’s books in the series “Who?” (Vem?) 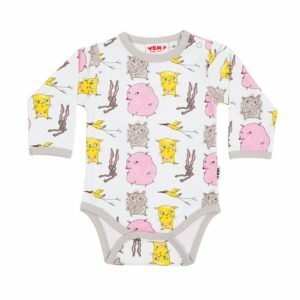 are featured on baby clothes for the first time – a collaboration between sisters Anna Hörling & Stina Wirsén and the clothes brand Sture & Lisa. In Sweden, the books have sold in nearly half a million copies and the books are distributed world-wide. 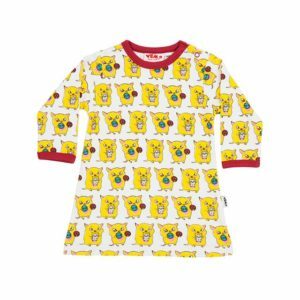 The baby and children’s clothes are unisex and fit both the youngest ones and older kids, with the cute onesies, jumpsuits, jumpers, pants, and a cute beanie. All produced in 100% organic and fairtrade certified cotton. All Sture & Lisa´s clothes are made of 100% organic (GOTS) and fairtrade certified cotton from India. Fairtrade means paying the workers a fair price, but also help people in the most marginalised communities escape poverty and promote sustainability. Our suppliers main objective are to provide paid employment to the disabled, and rehabilitate them in the society.The Globale Organic Textile Standard (GOTS) is recognised as the leading processing standard for organic textile worldwide.All Sture&Lisas clothes are hand printed with organic waterbased screen print. We avoid using all kind of damaging chemicals in the production. 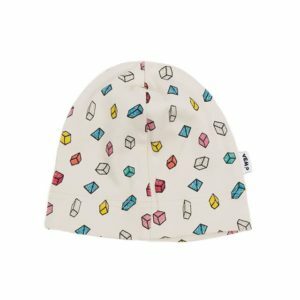 Baby and kids' hat in 100% organic and fairtrade certified cotton. Available in two sizes: 3-6 months and 6-12 months. Pattern: Cubes, by Stina Wirsén. Kids pants in 100% organic and fairtrade certified cotton. Available in four sizes from newborn up to 2 years. Pattern: Cubes, by Stina Wirsén. 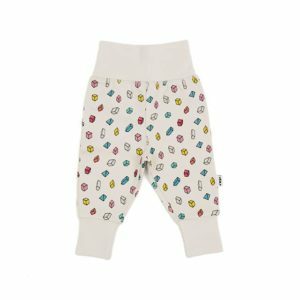 Organic Kids Pyjamas / Jumpsuit – Who Can’t Sleep? Cozy organic pyjamas / jumpsuit in 100% organic and fairtrade certified cotton. Available in six sizes from newborn up to 1.5 years. Pattern: Who can't sleep? by Stina Wirsén. Cozy organic pyjamas / jumpsuit in 100% organic and fairtrade certified cotton. Available in six sizes from newborn up to 9 months. Pattern: The "Who? characters", by Stina Wirsén. Pretty kids dress made from 100% organic and fairtrade certified cotton. Size 74/80 (6-12 months). Pattern: The "Who? characters", by Stina Wirsén. Cute sweater in 100% organic and fairtrade certified cotton. Available in two sizes from 9 to 18 months. Pattern: Cat and Teddy, by Stina Wirsén. 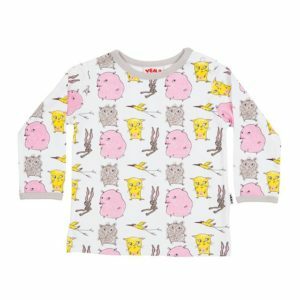 Cute long sleeve kids sweater in 100% organic and fairtrade certified cotton. Available in four sizes from 9 months up to 3 years. Pattern: The "Who? characters", by Stina Wirsén. 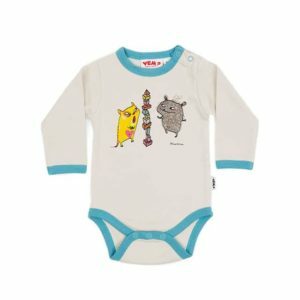 Cute romper in 100% organic and fairtrade certified cotton. Available in three sizes from 2 to 9 months. Pattern: Cat and Teddy, by Stina Wirsén. 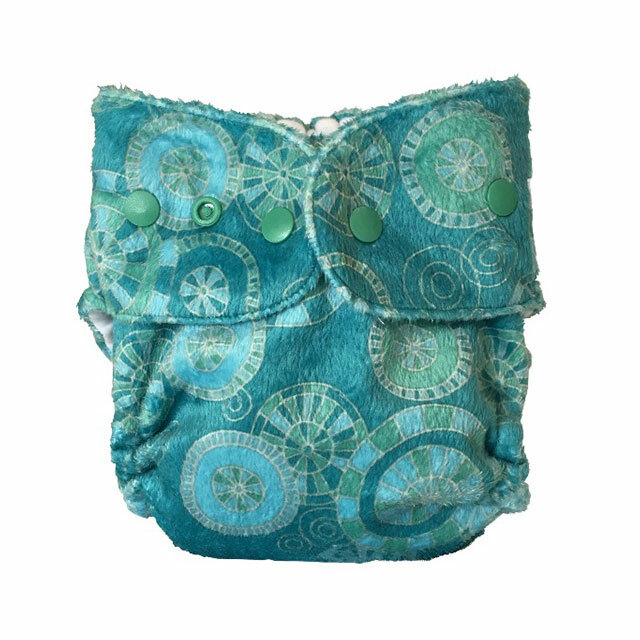 Cute romper in 100% organic and fairtrade certified cotton. Available in four sizes from newborn up to 9 months. Pattern: Teddy, by Stina Wirsén. Cute romper in 100% organic and fairtrade certified cotton. Available in four sizes from newborn up to 9 months. Pattern: The "Who? characters", by Stina Wirsén.